There were buried all the prominent citizens of Utica. Esra Cozier, an early village president and the first city treasurer in 1832, who fell a victim to the awful cholera epidemic of 1832, to whom a monument was erected by the Masonic Order, in which he was prominent. Just beyond was the grave of Major John Bellinger, who came with his uncle to Utica in 1788 and lived here until his death in 1865. Next to the Smith lot was that of Bildad Merrell, another Revolutionary soldier. Talcott Camp, the first village president, a man of exceptional ability and prominence was buried there. Then there was James Gurdon and Gideon Burehard, the Devlins, the village’s first iron workers, Dr. Solomon Wolcott and many others who were prominent when Utica was in its infancy. The burying grounds were, when additional land was added, divided into three portions. The portion on the south side of Water Street was known as the “private grounds.” The parties who had friends or relatives there purchased the ground of the Potter estate. Directly opposite on the north side of Water Street was the “old burial ground,” which contained about ten private lots. All the rest was devoted to the public. Since the only record of interments known to exist began on March 11, 1841, there is no way of ascertaining how many or where any particular person was buried. From 1800 to 1841, the old burial ground appears to have answered the burial purposes of the village and city of Utica. The number of interments in these years can only be arrived at by conjecture, but they must have exceeded 10,000. "The first President of the cemetery was the father of John Magee. Mr. Magee lived near the old cemetery. In 1831 the plot of land was surrounded by a substantial fence, the work being accomplished by various members of the church who volunteered their services, there being no sexton at that time. They also put the ground in thorough order. The fence remained standing for nearly 25 years, when a new one was built by direction of Rev. Father McFarland, then pastor of St. John’s Catholic Church." "The first remains interred were those of Mr. Magee’s brother, Edward, who died in 1827 and whose body had been buried in Potter’s Field in the absence of a Catholic cemetery. John Magee remembers well the first funeral to the Corn Hill Cemetery. In 1832, the great cholera year, these funerals multiplied in number and arrived at all hours of the day and night. Mr. Magee, Sr. kept the necessary graveyard tools at his house and the friends of the dead were in the habit of borrowing them to dig the graves with their own hands. During the prevalence of the fearful epidemic, the calls at the Magee house for shovels, etc. became very frequent, and the elder Magee became alarmed, got his team ready, put in about six weeks provisions, shut up the house and drove over the other side of Steele’s Hill, where the family took possession of a deserted log house. They remained there for five weeks, or until the last vestige of the plague had disappeared from Utica. The grave yard tools had, however, been left at a convenient spot near the cemetery." 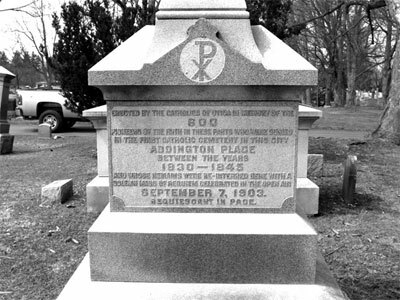 With the growth of the city, a larger Catholic burial ground was required, and when St. Agnes Cemetery was organized, the old Corn Hill Cemetery was abandoned and became a forgotten graveyard. In 1844 the Rev. Thomas Martin, then Pastor of St. John’s Church, purchased an additional five acres of land. In 1871, the Rev. Thomas Daly completed the cemetery property by purchasing a narrow strip of land along the gulf. 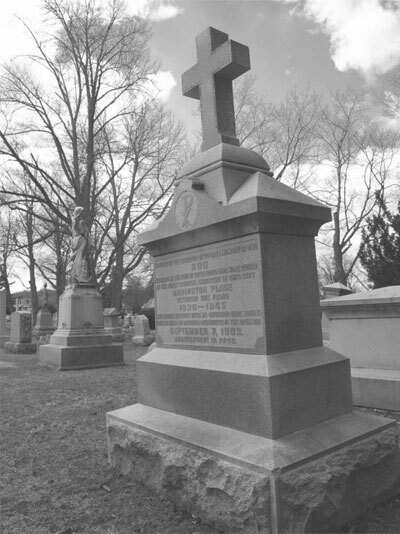 About this time, the St. Agnes Cemetery Association was formed and Father Daly was one of the original Trustees. The original purchase of land of St. John’s Church was conveyed to the new association. The original trustees were John C. Devereux, S.A. Warnick, John Carton, Thomas Bergen, James Merriman, Thomas McIncrow, James Home, Edward Ryan and William Kernan. In 1885 a Mortuary Chapel was erected in the center of the Cemetery and gifted to the Association by Mrs. Daniel Lalor Mitchell. At the present time the Cemetery consists of 45 acres and over 29,000 interments. For many years the Cemetery had an office in the Devereux Building in Utica, then later in the Banker’s Trust Building. In 1986 the office was moved to 601 Arthur St. where it is presently located.